Ghana Airways has officially folded up. It is to be replaced by a new company, Ghana International Airlines, which will operate as the official national air carrier. The new airline is a joint venture between the government of Ghana and Sky West Airline of the USA. 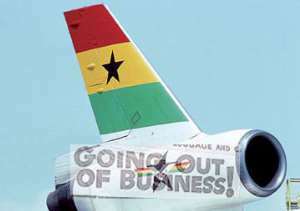 As GIA gears up for full operations for next week, workers of Ghana Airways have been complaining about their being left out of the loop. According to them, they've not been officially informed that Ghana Airways has folded up. Workers' representatives and the Trades Union Congress (TUC) are, however, reportedly studying government's proposals for a severance package. Ghana Airways employed about 1200 workers. Meanwhile, the Chief Executive of Ghana International Airline, J. Ralph Atkin and his executive team are continuing to work with potential strategic partners on code sharing agreements and other commercial arrangements in preparation for commencement of flight operations scheduled for the second quarter of 2005. Pre-sale of tickets is expected to start in March. GIAL is now actively negotiating for the necessary aircraft to implement its business plan and anticipates an initial fleet of 8 to 10 wide and narrow body aircraft.